MOSCOW, January 15. /TASS/. Russian President Vladimir Putin and US President Donald Trump don’t have any personal deals and all sanctions against Moscow are real and very serious, Kremlin Spokesman Dmitry Peskov said in an interview with Argumenty i Fakty weekly newspaper published on Tuesday. "This is delving into conspiracy theory, which has nothing to do with reality," Peskov said, commenting on a popular idea in the US that the Russian and US leaders have some personal arrangement and that all sanctions against Moscow are some child’s game that will soon come to an end. "Sanctions are no child’s game, this is a very serious thing," Peskov stressed. 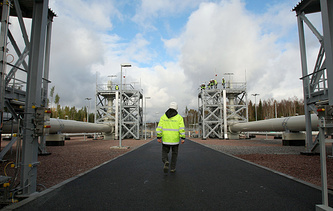 According to the Kremlin spokesman, any threats to impose restrictions on carrying out the Nord Stream 2 gas pipeline project "are an explicit attempt to ensure a competitive advantage for US liquefied gas, which is more expensive than Russian (gas)."